Everything has now been sent and received in the two Autumn exchanges I have participated in so I can now reveal all the stitchy loveliness. Firstly I will show you the pieces that I stitched – both similar designs but I did experiment with two new finishes. Both of these are from JBW Designs, one of my current favourites – this ornie went to Karrie in Australia. 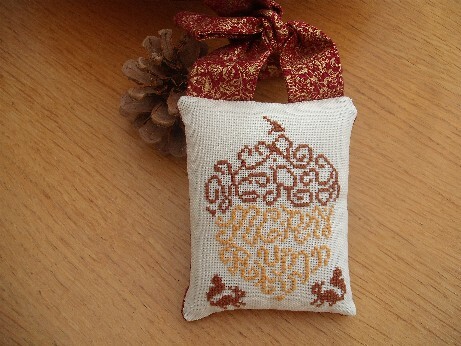 I made this up as a little hanging pillow adapting a design I saw on a blog somewhere. 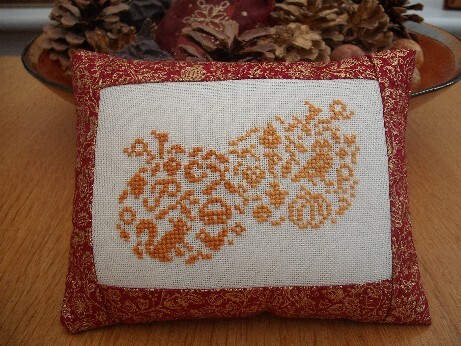 The second was an adaptation of another pumpkin design from them – they have several beautiful ones and this I finished as a bordered pillow. 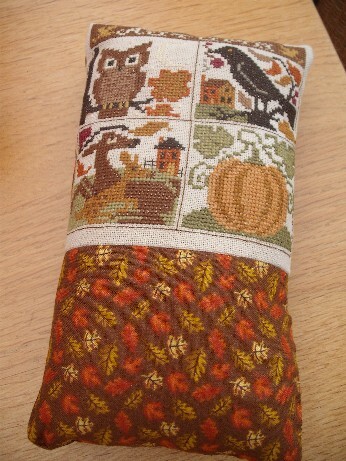 I used the same backing fabric for both pillows – can’t remember where I bought it from but it is a really rich design and complemented the autumn colours well I thought. Wish I could remember where I bought it as would like to get more! My piece from Karrie was waiting for me when I got back from Spain which was a lovely surprise. She had wrapped it in the backing fabric which is great as I am always keen to get themed fabric for my exchanges and she had included two gorgeous little Halloween buttons. 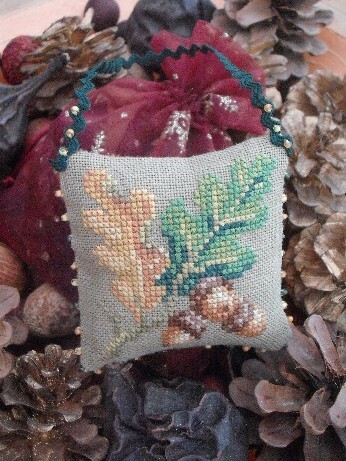 It is a beautifully stitched piece and finished with little french knots all round the edges and on the hanging braid. Wonderful work. Then yesterday there were more surprises from Kathy in the USA who sent me two parcels as she included some extras as well ( you didn’t need to but she very generously did so I have sent her some little stitchy goodies in return!). 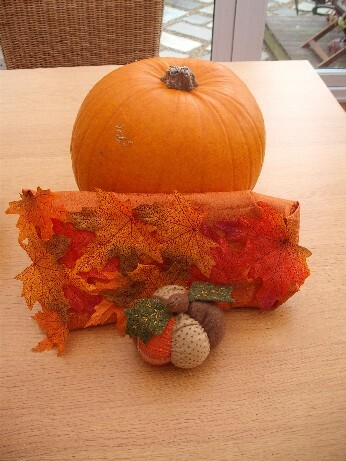 They were also very beautifully wrapped in material and fabric leaves which I have saved for a future project. 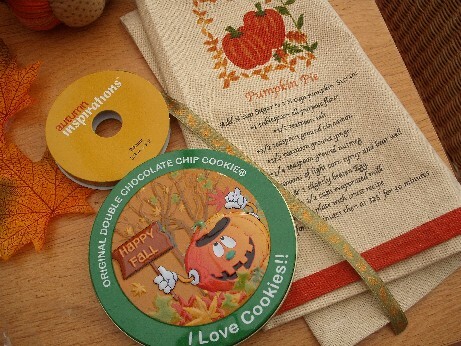 The extras were some Autumn ribbon, a pumpkin pie recipe tea towel and a cookie tin – with cookie which the children enjoyed! 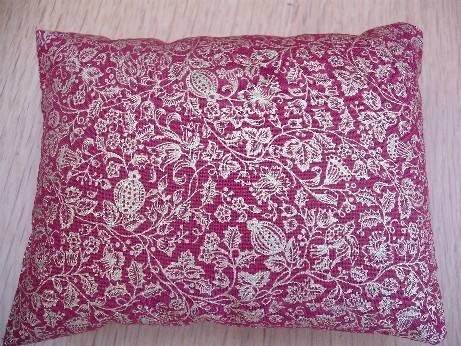 And then there was the actual exchange piece – another beautifully stitched pillow! Apologies for all the wavy lines on my pics – this camera is on its way out and I am going to treat myself to a new one after Xmas. I really love doing exchanges – people are so kind and put so much effort into their stitching and it really brightens my day to get a parcel. Not much has been going on here this week as I am still suffering with a very bad back so am out of action for anything requiring concentration all that has been achieved is some lying on the sofa making Xmas ornies – covering myself in pretty ribbon has a very therapeutic effect! Will post pics of the latest batch soon. Hi Alison, you received and sent some lovely exchanges. I am glad that you enjoyed your first exchange with us at Seasonal exchanges. I am sorry to hear about your back problems. They can be so awful and slow to heal. All the extra stitching time can be nice but I do hope your back is improving. Yes they certainly did make me smile, it was a very lovely surprise – have had a quick look at your blog as well and will go back and read more – your dog is very lovely! All those pretty things you’ve made Alison and I love all the swaps you’ve received. I know aren’t I a very lucky girl!